2. Turn all other switches OFF. 3. Open the fuse panel cover. 5. Pull the suspected fuse straight out. 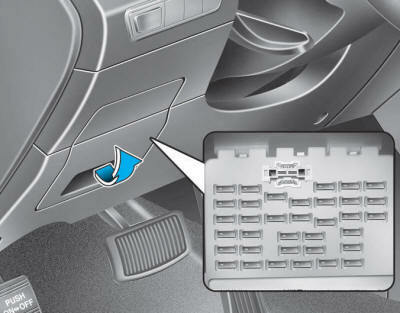 Use the removal tool provided in the engine compartment fuses panel. 6. Remove and check the suspected fuse; replace it if it is blown. 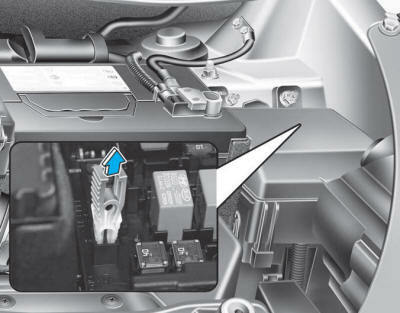 Spare fuses are provided in the instrument panel fuse panels (or in the engine compartment fuse panel). 7. Push in a new fuse of the same rating, and make sure it fits tightly in the clips. If it fits loosely, consult an authorized HYUNDAI dealer. In an emergency, if you do not have a spare fuse, use a fuse of the same rating from a circuit you may not need for operating the vehicle, such as the cigarette lighter fuse.